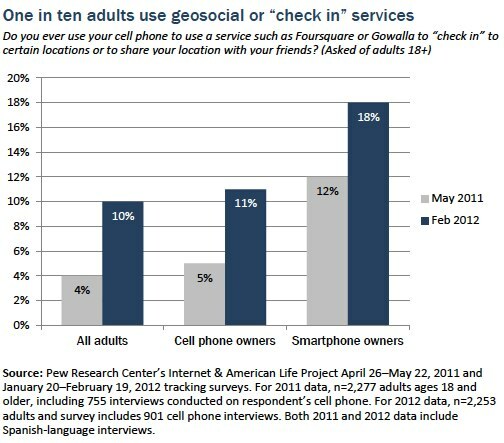 Some 18% of smartphone owners use geosocial or “check-in” services like Foursquare, up from 12% in May 2011. This works out to 10% of all adults (up from 4% in May 2011). While there are still some differences in geosocial use among smartphone owners of different demographic groups, the differences are not as strong as they were in May 2011. Among smartphone owners, the most striking differences in usage are still by age group: Some 23% of young adults ages 18-29 use geosocial services (up from 18% in 2011), compared with 14% of smartphone owners 50 and older (up from 2% in 2011). Unlike as with location-based information services, smartphone owners with lower household incomes are somewhat more likely to use these services than those in higher-income households. 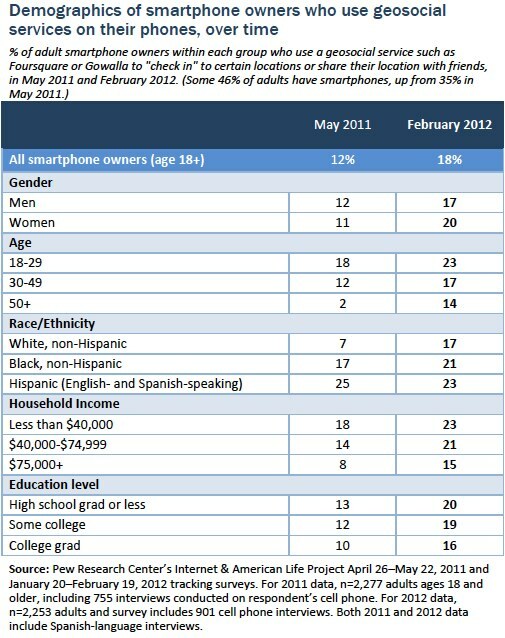 There are no significant differences among smartphone owners by race or ethnicity. As of July 2011, some 23% of all those ages 12-17 say they have a smartphone.11 Our recent report, “Teens, Smartphones & Texting,” found that ownership is highest among older teens: 31% of those ages 14-17 have a smartphone, compared with just 8% of those ages 12-13. Teens whose parents have a college education are also slightly more likely to have a smartphone (26%) than teens whose parents have a high school diploma or less (19%). In addition, another 54% of teens have a regular cell phone (or are not sure what kind of phone they have), and 23% do not have a cell phone at all. 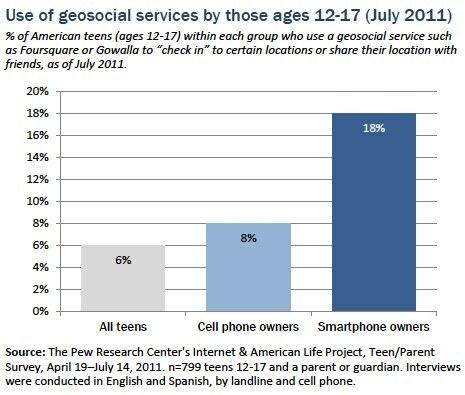 Among smartphone owners, teens’ use of geosocial services as of July 2011 is similar to that of adults in February 2012: 18% of teen smartphone owners ages 12-17 use geosocial services, compared with 18% of adult smartphone owners age 18 and older.12 Overall, 6% of all American teens use geosocial services on their cell phones, as shown in the following table.